Iva Duvet Cover by Holly Willoughby features a sophisticated soft grey lace print set against crisp white cotton. This stunning crisp cotton duvet cover is enhanced by rows of neat pin tucks, offset with grey embroidered edging. 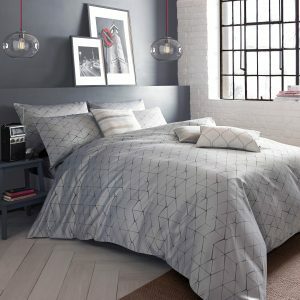 This has a 200 thread count and is 100% cotton.